Enhancing the look of your smile can be done with a number of cosmetic procedures, including veneers. Porcelain veneers can reshape, brighten, and eliminate gaps within your smile. Our board certified prosthodontist, Scottsdale’s Dr. Michael L. Bleeker, has specialized training in providing porcelain veneer treatment for patients looking for an aesthetic enhancement to their smile. Made out of thin layers of porcelain, veneers are shaped to match the natural contour of your teeth. These custom created restorations mimic the luminescence of your natural smile and are long lasting and stain resistant. To apply these restorations, Dr. Bleeker shapes the surface of your tooth, to make them better able to support the veneer. The porcelain shell is created specifically to fit your tooth, complimenting your smile and providing you with an aesthetically pleasing, comfortable enhancement. Porcelain veneers are then affixed to your teeth with dental adhesives. With proper care and maintenance, your veneers can last for many years, providing you with lasting results. 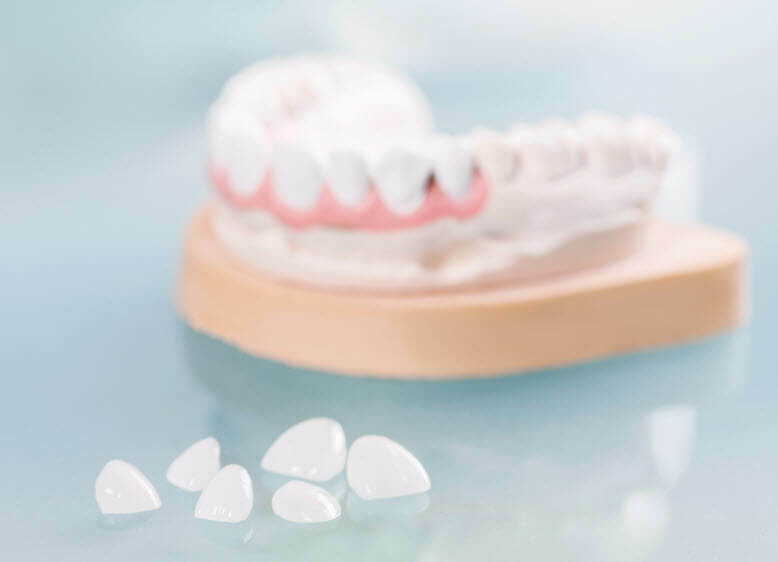 There are variety of materials that can be chosen for dental veneers, however porcelain veneers are not only the most aesthetically pleasing material, but are known to be the most durable. Veneers are suitable for patients who have minor crowding, stained teeth, mismatched teeth sized, and gaps between teeth. These wafers of porcelain correct minor imperfections, making for a seamlessly even, straighter smile. Porcelain veneers can whiten a smile, especially one that is deeply, intrinsically stained due to infection or life-long diet habits that can discolor teeth. Their opaqueness, and our doctor’s ability to choose the specific shade of porcelain, make for a natural-looking whitening of the smile. As your Scottsdale prosthodontist, Dr. Michael Bleeker had dedicated his continued education to providing the highest standard of care for his patients. Dr. Bleeker takes his time to understand your aesthetic goals, as well as provide a treatment plan that results in a beautiful smile. Veneers are provided on a case-by-case bases, with treatment plans designed specifically for your needs. Porcelain veneers correct color, contour, and position of the teeth. At our Scottsdale dental practice, we educate our patients on a variety of treatment options that will best care for their oral health and meet the aesthetic specifications. Dr. Bleeker and rest of our staff are passionate about providing porcelain veneers that strengthen worn down, discolored, and chipped teeth. No matter the treatment method, patients leave happy and satisfied with their smiles. Contact our Scottsdale Dental Practice Today! For more information about our variety of cosmetic dental procedures, or if you’d like to schedule a veneers consultation, contact the dental practice of Dr. Michael L. Bleeker today.